Now that this Boosted Noob *finally* got Green Fire after close to 100 attempts, here are a few things I learned that might help other Boosted Noobs (and non-noobs) who are struggling with this encounter. Yes, about 100 attempts screams “fail Warlock” but on the bright side, I’ve seen it all and done it all – a lot more than the “leet” Warlock who gets it in 5 attempts. I was going to break this up into a couple of posts but I think I’d rather have it all in one place so I don’t forget anything in case I go back. Yes, wall of text. Watch these two videos. I mean it – watch them until you dream about them. But he makes mistakes – more than a few. What this video taught me was yes, I’ll never be an ultra-elite World Class Warlock, but you know what? Even the Best Warlock in the World makes mistakes. So really – who cares how many mistakes I make or how many attempts it takes me to get it? There are no Achievements, Awards, Feats of Strength or anything else other than Green Fire. It can take 5 attempts or 500. It doesn’t matter. You only have to beat it once. The trick is knowing when you can recover from those mistakes and keep going, or when it’s time to wipe it and give it another shot. Ignore all the people boasting about how few attempts it took them or bashing those that took more attempts. For all we know they are fibbing about it or exaggerating to make themselves look “leet” – only the Blizzard Logs know for sure so I take it all with grain of salt. I did it as Destruction since this is the only spec I know. There are guides out there for other specs but from what I’ve been reading, Destruction is the way to go. It’s not a gear-check or dps race. It’s all about learning the mechanics and doing the right thing at the right time. The more gear you have, the better your dps so all that means is that you will have fewer cycles to go through the more dps you pump out – which can be good but not required. Once you get the mechanics down, dps isn’t as important as beating the 7-minute enrage timer. Executing the mechanics consistently will give you plenty of time to beat it. I did it in mostly LFR gear with an ilvl of 525 – and my dps was averaging about 85k. Yes, I’m THAT bad and I did it so there is hope for all! Glyph of Enslave Demon – enslave that Pit Lord fast! Wow, if nothing else this fight showed me how inefficient my set-up was and I was forced to switch things around so I could hit the right spell at the right time. For example, I had Rain of Fire keybound to Shift-some key. Pressing Shift-key Shift-key Shift-key was way too slow as Rain of Fire needs to be put down fast for the Imps and Fel puppies stages. Things really turned around for me when I keybound it to something for one key press instead of Shift/Alt/Cntrl combos. Yes, it took me quite a few failed attempts to “learn” my new keybinds, but once I got that down it made things MUCH easier. I set mine over to the side and set up a big, giant cast bar for Kanrethad so I could time my Pit Lord’s Charges – this is important! You need a way to track the DoTs Kanrethad puts on you so you can dispell them quickly. I didn’t really have anything set up, but I did have VuhDo for my Priests so I used that to track debuffs. I also set up the VuhDo spells for Unbound Will, Singe Magic and the Pit Lord’s heal but I didn’t really have to use them. I read a ton of good advice from the official Blizzard Warlock forums regarding Macros. Just make sure anything you read is for the 5.4 Patch since some Warlock abilities got the nerf-bat and pre-5.4 strategies don’t quite cut it anymore. I tried all the macro suggestions and some were useful for me and others were not – use whatever works for you. Kanrethad’s Chaos Bolt – teleports with bubble – just in case…and yes, this did save my sorry behind more than few times. Dispells – I was using these separately but that was just one more thing I had to watch to use on CD, so I macroed them together. Unbound Will has a longer CD than Singe Magic, so when it was up, it was up. I also had a sound play when Singe Magic was off CD so I would notice it right away. Pit Lord abilities: there are some good macros out there – for example, using the Pit Lord’s Breath on you to clear DoTs but honestly, I just didn’t have enough keys (I could reach quickly and accurately) for all the macros so I just clicked the Pit Lord’s abilities. I set up my Teleport beside the pillar and would run behind it to LoS the Chaos Bolt. I also set up my gates as a backup although I really didn’t need them. The guides will have you put your teleport behind the pillar but I found I always wasn’t in the right position to get there in time which is why I put it beside the pillar and then just ran behind it as shown in the screen shot. Use whatever works best for you. I also set up two raid markers – one to indicate where I had to be to get my Teleport, and one to indicate where I needed to move the Pit Lord before the Fel puppies stage. Raid marker positions shown in the screen shot – yellow for Teleport and red for the Pit Lord position before the Felhunters phase. Note: I actually moved the Pit Lord a little closer to the Portal than where the raid marker is located. I found that if my Pit Lord was too far away, the Charge wouldn’t hit the puppies before my Chaos Bolt hit them. Try not to make the Pit Lord run too far. With all the “stuff” going on, I found the raid markers really, really helpful. Not dispelling this stuff quickly and frequently enough along with not healing enough is what would kill me more than failing mechanics. The Pit Lord’s Fel Flame Breath should be used on yourself every chance you get and you will get plenty of chances using it on Kanrethad, Imps and whatever else you need. All you need to do is run into it or just stand in it a second to clear all those nasty debuffs. A few times I wouldn’t clear them fast enough and I’d get purple puddles on the ground or the Annoying Imp. Purple puddles will fade after a while so just avoid getting sucked into them. The Annoying Imp will stun you every so often so getting rid of him is a bonus. The Pit Lord also has a very powerful heal – use it every chance you get especially before the Imp and Fel puppy phases where you might have to stand in Fire for a few seconds. I wanted to save all my Embers for Chaos Bolts so I tried not to use Ember Tap unless it was an absolute emergency. As Kanrethad is casting Imps, get behind the Pit Lord and drop Rains of Fire at the portal entrance. 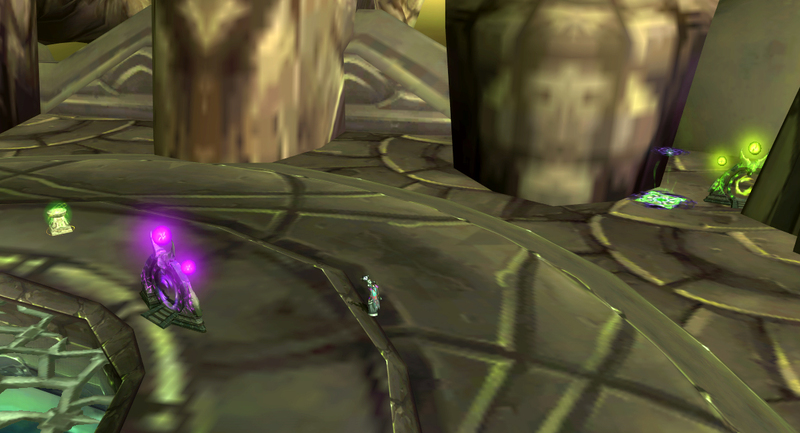 I would fail at the Imp Phase because a bunch of Imps would be hanging around the entrance and I’d miss them. As soon as Kanrethad’s Imp cast hits zero, stun him with the Pit Lord’s Charge, immediately use the Pit Lord’s Fel Flame Breath, then Rain of Fire the rest down. The key to this is getting behind the Pit Lord AND hitting Charge right when his cast ends. If you’re at the side or little slow hitting charge, Kanrethad will turn to attack you and your Pit Lord will go behind him and well…then it doesn’t work. Get the timing right on this and it works – every single time. I never had to use F&B on the Imps to kill them all so that is one less thing to worry about. If you get a few stragglers don’t worry about it – toss a Rain of Fire on them and they will die. I’ve had enough attempts at this to see both versions. Sometimes at the start of the Encounter Kanrethad will run to the center and cast Catacysm *before* the Imp Phase. It’s a fake – if you get this, think of it free extra dps time, extra time to dispell DoTs and/or heal up. Usually he’ll do the Imp Phase then cast the real Cataclysm. When you get the real Cataclysm, try to have at least enough embers for a couple of Chaos Bolts. If you only have one Chaos Bolt ready, save it for the Fel puppies unless you’re SURE you will have another one after Cataclysm. Remember – it’s not so much about dps as it is staying alive. When Kanrethad starts casting Cataclysm, start casting your Chaos Bolt THEN hit the Pit Lord’s Charge to stun him. If you don’t have a Chaos Bolt ready, Charge him and give him whatever you’ve got. I would tend to err on the side of caution and not wait to long to Charge as sometimes it would seem I had enough time when I really didn’t – lag doesn’t help much either. 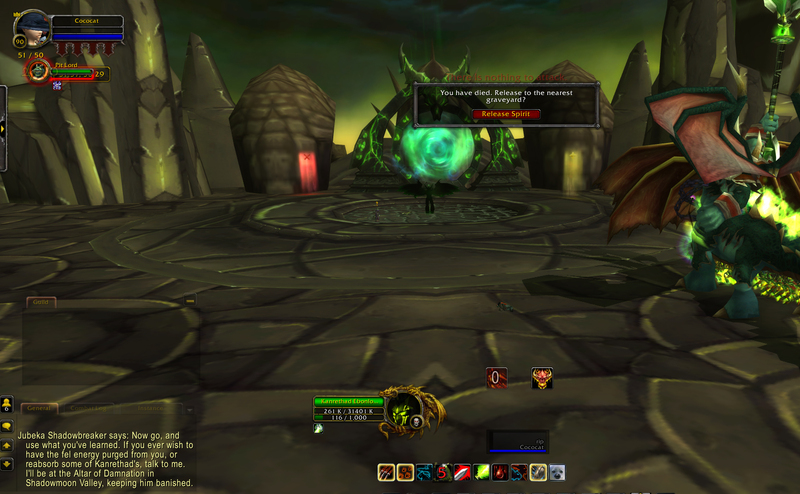 Move your Pit Lord ASAP (ideally right after the Charge) over to the right side of the portal and get yourself to the left side to get ready for the Fel puppies. Yes, this is probably the toughest part of the fight until you get the mechanics right because those nasty puppies will eat your Pit Lord enslave and then it’s party over. I never had my Pit Lord on Passive or remembered to use Soulshatter while Kanrethad was summoning puppies so if you do, this might work better – I don’t know. What I do know is that it was usually Puppy #3 that would come out of the far right side of the portal where I parked my Pit Lord and eat my enslave. I don’t know if where they come out of the portal is random or dependent on something else I was doing, but about 40% of the time Puppy #3 came out at the far right and barked at the Pit Lord. I finally figured out I was losing the enslave to Puppy #3 because I wasn’t dropping Rains of Fire to cover the ENTIRE portal entrance to aggro the puppies as they came out. Put Havoc on the first puppy out of the portal. Keep Rains of Fire up along the entrance. I used to use the strategy of putting conflag or whatever on this or the first puppy then doing the Charge. I had more successful, consistent attempts when I ignored this puppy completely and focused on the last puppy. Keep Rain of Fire on this one until you are SURE he is coming towards you. A few times he would turn and bark at the Pit Lord but then he’d turn and run towards me and I wouldn’t lose the enslave. As he’s coming towards you, start casting that precious Chaos Bolt. Use the Pit Lord’s Charge on Puppy #3 and if you timed it right, your Chaos Bolt will hit AFTER the Charge when the puppies are stunned. Two will die, then just kill whoever is left as fast as possible because Kanrethad will be gearing up for a Chaos Bolt you will have to avoid. Once I started targeting Puppy #3 for the Chaos Bolt and Charge, it worked Every.Single.Time. I couldn’t get the other method to work because when they are all grouped up I found it hard to target the “right” one, so I just simplified it for myself and focused just on Puppies #1 and #3 as they were coming out of the entrance. Only two things you have to remember about the Doom Lord stage – Dismiss and Re-Enslave your Pit Lord while Kanrethad is summoning *before* the Doom Lord appears. Until you get Kantherad down, the cycle keeps going for one more Imp/Felhunter/Doom Lord phase, and after that, you will ONLY get Imps and Doom Lords – no more puppies – Yay! So…if you make it past the second Felhunter stage, you should be gold if you can keep dispelled and alive. If you die AFTER the second Felhunter stage, you can still use your Pit Lord’s abilities to try and defeat the boss as you will not lose your Enslave unless you forgot to refresh it at the first Doom Lord stage. I died and managed to defeat Kanrethad with the Pit Lord as I had him down pretty close before I died – just took a Pit Lord charge and breath to defeat him. If you do die but manage to defeat Kanrethad and the quest completes, be aware the Pit Lord and Doom Lord(s) *might* not despawn and they will come after you. I found it more efficient just to leave the instance and turn in the quest/get my Green Fire at the Altar of Damnation in Shadowmoon Valley. Well i’ve tried and tried, managed to get to the 2nd Fel hounds but it all fell a apart, I think i only had him at about 60% at that point. One day maybe!! Don’t give up – it took me almost 100 attempts to get it. If you’re getting to the 2nd Fel Hounds stage you’re almost there. Most of your big damage on him will be when you stun him to interrupt Cataclysm – make sure you have a Chaos Bolt ready for it and that will knock a lot of health off him each time you do it. You should get a lot of extra embers for one during the Imp phase. If you dps is low because of gear, use flasks, potions, drums – whatever you got. Make sure your gear is properly gemmed, enchanted and reforged. Get some LFR gear if you need it. I had mostly LFR gear and a couple of Timeless Isle pieces. Well tried a lot more and was getting closer, got to the 3rd set of imps and just above 20% with 44seconds on the clock, so close! After that one i had to take a break cause it was going down hill again haha. I think i need to time my chaos bolts better and try not to lose the plot when the fel hunters come out. I’ve been using havoc on one start casting my bolt on the other, then use the stun which give’s me 100% dmg on them, two go out in one shot. Seems to be working for me so far. My item lvl is 520 but its all pvp gear. Thanks for the reply btw i’ll keep at it, well once i get some more gold for repairs ha! You’re doing a lot better than I did! Gear doesn’t matter as much as getting the mechanics right. Many people have done it in all ranges of ilvls and PvE/PvP gear. Higher ilvl will help will higher dps and fewer “cycles” but once you learn the “dance” you’ll nail it. Sounds like you got the Fel Hunters dead on (pardon the pun lol.) That’s the hardest part so you’re close. Are you remembering to cleanse the DoTs? That’s what would kill me more than failing mechanics. Try what I have suggested in Macros/Dispells and just keep spamming that macro and using the Pit Lord’s Breath and Heal on cool down. Grats! Now you’ll get the title too!